The little black ant (Monomorium minimum) is a species of ant native to North America. It is a shiny black color, the workers about 1 to 2 mm long and the queens 4 to 5 mm long. It is a monomorphic species, with only one caste of worker, and polygyne, meaning a nest may have more than one queen. A colony is usually moderately sized with only a few thousand workers. 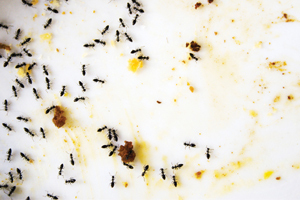 Monomorium minimum are scavengers that will consume anything from bird droppings to dead insects. 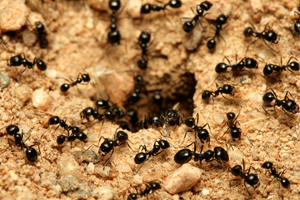 Workers may forage in households, but nest in soil mounds. It also tends aphids such as the soybean aphid (Aphis glycines), harvesting honeydew. During mid-summer the queens and males perform the nuptial flight, mating in midair. The males die shortly after. Each queen constructs a new nest, sheds its wings, and lays eggs. The development from egg to adult takes about a month. Little black ants (Monomorium minimum) they are widespread in urban and industrial surroundings. Little black ant colonies can house several thousands of individuals and are located primarily in dark, protected areas. Little black ants prefer to live outdoors in decaying wood, but will also build their nests in cracks in walls or cement. Outside, little black ants establish their nests under rocks or stones and in rotting logs, gardens and other open areas. Their nests can also be located within small craters of very fine soil. Indoors, little black ants build their nests in voids and cavities such as wall voids. They at times can forage for food indoors. 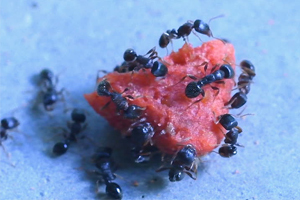 Little black ant workers forage with scent-marked trails. They feed on aphids and plant secretions, as well as sweets, greasy items, meats, fruits and vegetables. Unless you use a non-repellent spray, baiting is the preferred treatment over typical residual spraying. Baiting is the most reliable way to eliminate the entire colony. When choosing ant baits, it is best to choose from both the sugar-based baits and protein/grease-based bait.